Here we are going to discuss detail procedure how to jio sim on samsung 4g device or any 4g device..
Jio Preview Offer Is Availble On Selected Samsung Device Or Any 4g Device. · 1.Download the MyJio App from Google Play. · Open App and it will show you a list of apps. Click Open on MyJio App. · Now you shall see a screen with the following options: Sign Up, Sign In and Get Jio Sim. · Click Get Jio Sim Option. · Follow the instructions there. · It will generate a barcode for you. · Take a screenshot of the barcode. Install App From Here New App Fix The Bug. · Open App. You shall see a list of apps. Click Install All and Install All Apps one by one. · Now turn off the Internet. Open MyJio App. · From the list of apps, choose my Jio app. · Turn on the Internet. · Click on Get Jio Sim. · You are done here. Take Your Valid ID Proof and Address Proof with 4-5 passport photos. Search for the nearest Reliance Jio Store. Note -For user with other 4g phone must know all jio office nearby them as if any office deny to give. · Visit your nearest Jio Store. · Just take your handset and show them your documents. · Give them documents with the barcode first and ask for the sim. · If they ask which phone you own, tell them the name of any supported Samsung Device. · If they ask to show the phone, say it’s not with you right now. · You can also say you forgot to bring it, or it’s with your Dad or makeup anything to manipulate them. · If they ask for phone or IMEI. · Then visit other jio office nearby you. · After that you will get a message which will ask you to televeriy . Call 1977 if your phone supports VoLTE. Or follow the message on alternate number. · You will get 2 gb 4g data and some calls and messages. · Now go to my jio app and install all aps using jio 4g if install before uninstall it and do it again. · Now go to my jio app and sign up. · Now go to all subsdiary app and open them once. · Now again go back to my jio app and it will automatically get sign in. 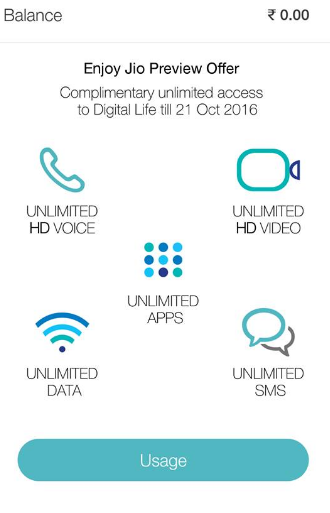 · Voila your unlimited data started. To make sure you did everything correctly, I am attaching a picture here. When you open MyJio app after performing all steps, you shall see this, as seen in the picture below. That’s all. If you still couldn’t Manage a Sim, Sorry! Please Share Our Service Info With Others. Note - I am again tellling that this method is written just for information, as many people asked me how did others do it. I am just providing the method as it is.I don’t recommend anyone to try it. And I am not responsible for anything.